Version 2.0.2 now available ("Regional Date" bug fixed). 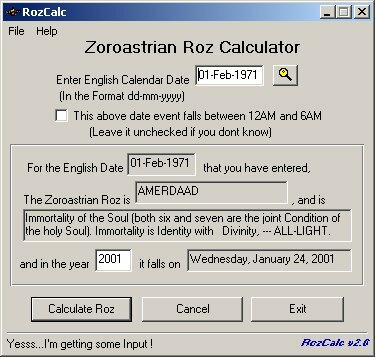 RozCalc is a simple program which calculates the Zoroastrian Roz / Roj for a given English Calendar date. It also calculates the date of that Roz for a particular year. No more hunting for that "Gujarati" calendar to locate the Zoroastrian Roz. Especially useful for Zoroastrians living out of India who want to celebrate their birthdays or other events as per the Zoroastrian calendar. The program will prompt you to enter the date in the format set in the Date setting of your Regional Settings. For Example : The Program prompts me to enter the date format in "dd/mm/yyyy" and I enter a birthday : 01-02-1971 (1st February, 1971). RozCalc calculates the Roz (AMERDAD) and the date (24th January, 2001) being the English calendar date of that Roz in the year 2001. RozCalc runs on Windows 95/98/ME/XP/NT/2000. Download the latest version of RozCalc from this Web site - http://parsiweb.tripod.com. Click on the file name you want to download above. Save the program RozCalc.zip into a folder on your hard-drive and then double click to Unzip it. If you don't have WinZip the unzip utility, get it from here. Click the "Install" option, then "Install" button in WinZip as per the prompts. If you don't get a "Auto Install" from WinZip; just double-click on the "setup.exe" file that is extracted. Follow the instructions for installing this program on screen. RozCalc will get installed on your hard-drive. Run RozCalc by clicking on the Desktop icon or clicking it from the Programs Options in your Start menu. Read the Readme.txt and Calendar.txt files which are in the folder that RozCalc got installed in. If you are having any problems or questions on installing or running RozCalc, please read the Frequently Asked Questions (FAQ). If the FAQ's don't answer your problem or question, email me at burzinbuzz@hotmail.com. This program is Freeware. It is free for your use and distribution to your friends in the same state as it is. Have fun with it....."What was the Roz when man first landed on the moon??" on the 16-07-1969, RozCalc will tell you ! Any suggestions, bug reports, etc. you may email me at burzinbuzz@hotmail.com. *Any donation you make will be forwarded to Burzin's favorite charity (The Parsi General Hospital - Mumbai). How did you learn about RozCalc?